Vertabrae_01, is a re-exploration of the sculptural forms found in a small antelope vertebrae, (a Duiker to be exact). 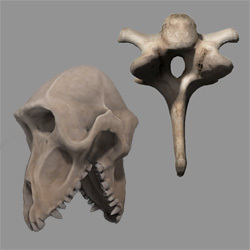 In this AR representation the organic beauty found in a single vertebra is emphasised by its up scaling. I have intentionally contrasted this monumentalisation by keeping closely to the original colour and texture, whilst re-interpreting the sculptural forms. MirrorBaboon, plays with the shapes of a Baboon skull mirroring itself, again the scale has been augmented to allow for more detailed exploration of the forms of the skull. My practice merges art with my interest in the study of bones (Osteology) and anatomy through digital sculpting techniques. Through my works/explorations I hope that people can gain an appreciation of the aesthetic forms found within bones, without its associated morbidity. My digital practice is driven by tools and equipment used to make, structure and display a sculptural form. The final representations of the forms are varied in their re-display, they can be screen based, interactive, 2D digital prints or displayed as a tactile 3D print. The commonality of these ‘forms’ is that they have a common production process and are all derived from objects in the physical world. Jake Hempson is a multi-disciplinary artist and animator currently completing a Masters by Research at QUT’s Faculty of Science and Technology. His practice-led research incorporates and translates ‘found art’ into the medium of digital sculpture. He uses photogrammetry techniques to capture 3d material, which he then reinterprets, digitally recombining the forms using voxel and polygonal based sculpting tools.